There's just something about a slouchy longline blazer that always feels effortlessly chic; that rare marriage of luxe and powerful, yet casual and cool. 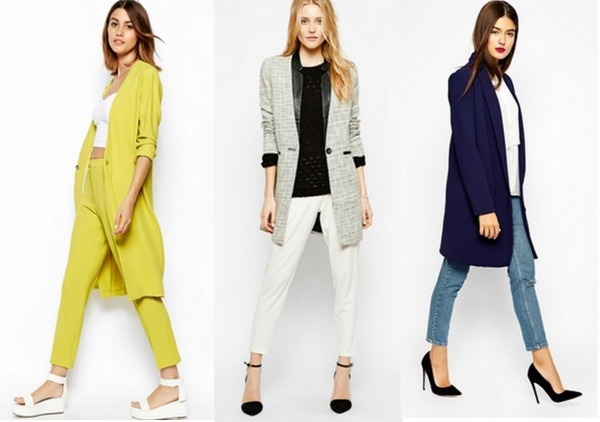 Below are nine of my favorite longline blazers, jackets and cardigans currently available! Click to shop your favorites! i really love the colors of the outfit! so calm and stylish! Fantastic boots and chic scarf! You always look so stylish! OMG! 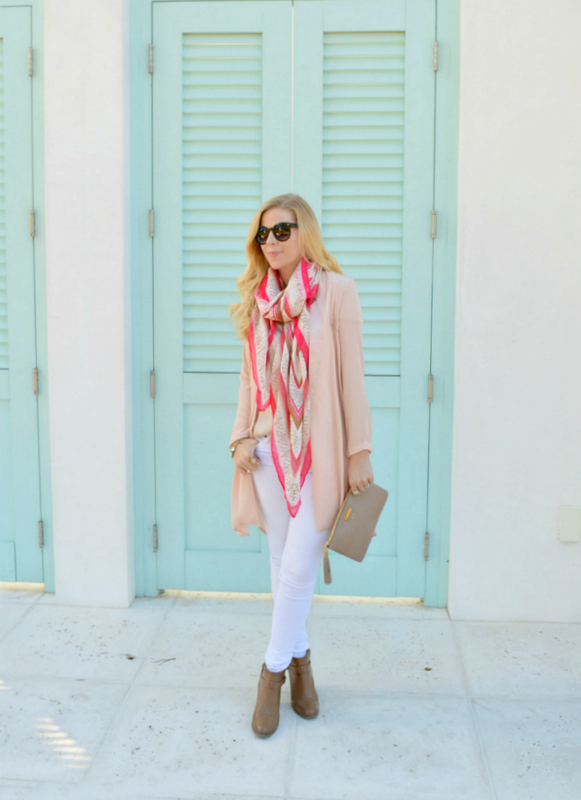 What a gorgeous look with all those pastel colors! The long blazer and the scarf are match made in heaven. I absolutely agree! You must have a long line blazer for fall - why don't I have one yet?! I love your pastel look here - it is so gorgeous! 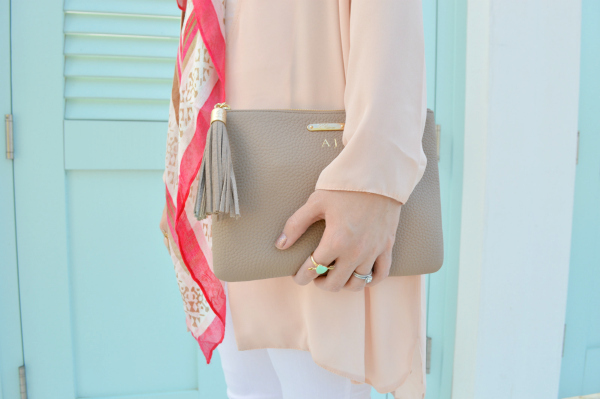 I love the light color pallet of this outfit! You look marvelous! 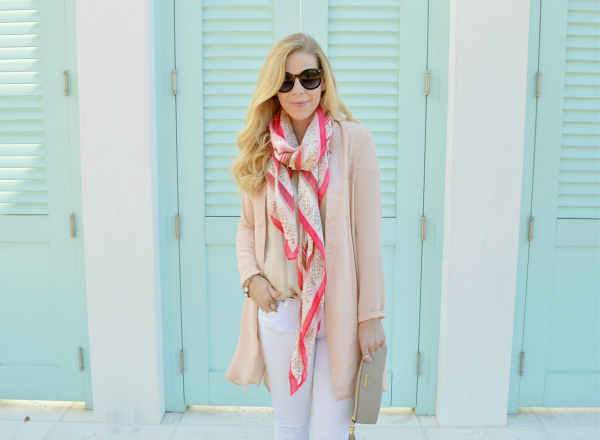 Love the longline blazer and the beautiful scarf! that asos cardigan at the top is probably my favorite of this bunch! I love the laid back, yet professional, feel of the longer lines. thanks for sharing, anna! I totally agree. I think I need to add it to my collection stat. :) Thanks for the comment, love. Nice duster! The scarf really made the outfit! Love this look! The colors look great on you. I just ordered something similar from Asos and now I am even more excited for it to come in. Love your neutral palette. In love with that look! gorgeous as usual! I always love stopping by your blog and seeing all of your beautiful outfits. This one is just stunning! Everything about it screams perfection! I never think about wearing white pants in the cold weather. I always just wear my stupid jeans. I have to try this. 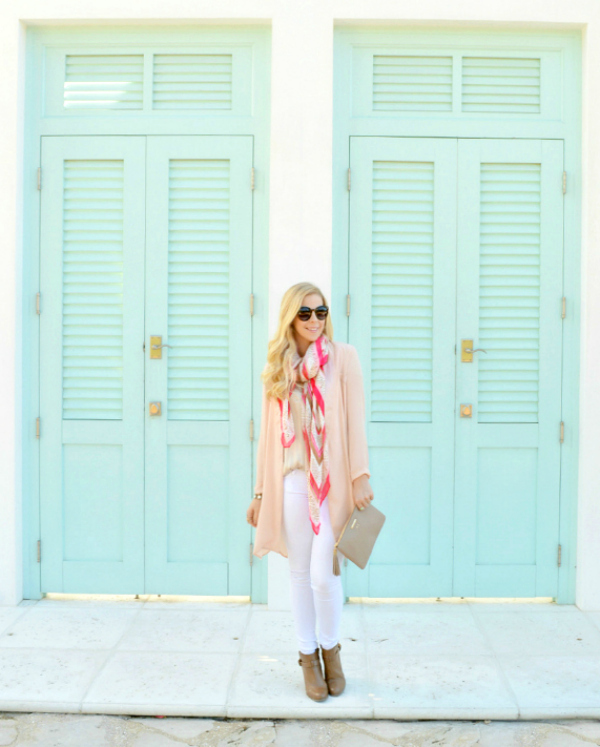 Love the long cardigan and the mixture of soft neutral tones! I am loving the color combination in your outfit! So refreshing for fall! I really, really like this! I have never really seen these before and I will have to maybe invest in one! You look so great and that scarf is so pretty! Great look! I love that long blazer. The scarf was the perfect pairing. I really love this outfit especially the scarf. Love the longline blazer + the scarf!! The bottom middle is my favorite, so gorg! wow, I love this. The pink and teal go so well together. I looove this look! I wear my classic black blazer all the time but this longer version is a refreshing alternative and instantly elevates any ensemble! Very cute look! Reminds me that I need a pair of white jeans in my closet! I love everything about this! 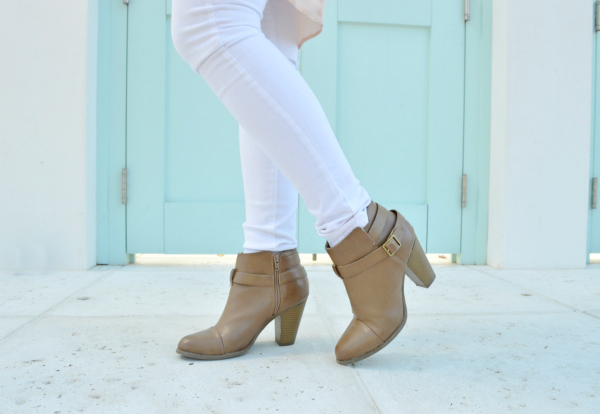 The colors are beautiful and your booties are perfect! Great look! Loving the blazer - makes you look extra tall! I totally agree. They have a way of making an outfit the perfect mix of dressy and casual. I particularly love the colour of the one you're wearing! It's beautiful. These colours are so nice! The booties are perfect! Love these light and bright colors! Such a nice departure from all the neutrals. I love the color of this blazer, it's so cute. 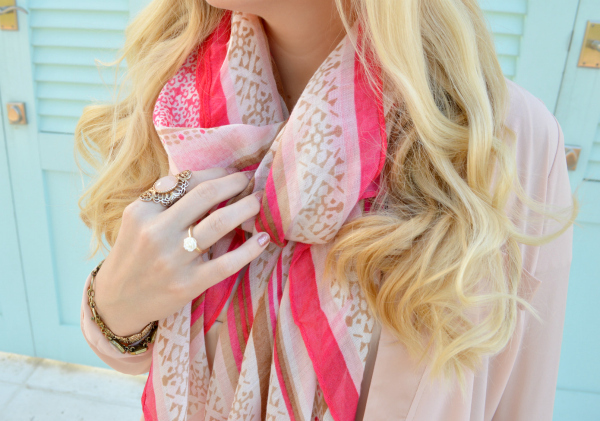 Love the scarf - so pretty! love the color of your jacket and that scarf! gorgeous outfit. Love this look. Very feminine as well. I love the neutrals you have going on in this outfit. You always look so lovely! I love the details and how feminine this whole outfit is. The blazer is great and all the other options you gave us are fantastic. I also love your boots! Thanks so much, Carli. The clutch is definitely a must. I'm trying to hold back from getting it in every color. lol. So beautiful! Please stop by my blog, hope you'll follow along! Just LOVE your pink and cream colour palette! SOOO chic! SOO stunning! I'm actually not a fan of the long style at all, as I feel it makes my frame look too short and bulky. You pull it off impeccably, though! I like the use of the scarf a lot! I totally know what you mean. I'm 5'5 and it definitely makes me look shorter in person, but I've found the longer ones to be extra flattering. The thinner, light fabric is a great solution for hiding any bottom of thigh insecurities, without packing on bulky layers. Gorgeous blazer! Such a fabulous combo and you look super fierce. Love it! Happy Halloweekend! This is a perfect look. I love everything. I thought it was a sweater at first glance but I love the blazer! This is gorgeous! Such a great piece for your wardrobe! Love all of these choices, and your outfit is gorg! Obsessed with this trend! Loving the pink Asos one! Pretty colors. Love with the white jeans. WOW! Pink looks so good on you. It is a beautiful look! This outfit is gorgeous. Love the scarf. This pictures are incredible, loving the pastels! Amazing look! I love the combination of colors!! I am loving this look so much! Of course, you always look fabulous in all your outfits! I love your sense of style so much!! OGWhatsapp APK and WhatsApp Plus APK. Ac market and searching for the absolute best and extremely well known play store and furthermore the application store of apple options, at that point we will reveal to you that nothing is superior to the business sectors of broke apk like Ac market ios application store.